FREEDOM and independence, as in the case of Rome which was not as conspicuously formidable and sturdy then as it is today, are not be achieved in a matter of ordinary breathing seconds. They consume presumably one's entire life even at the expense of his own courageous and valiant self for it to be attainable eventually. One might even find to his sheer consternation that it could in all likelihood not be capable of being actualised at all. Our mighty forefathers in their earnest crusade for self-determination and against any manner of attempts to insult the sanctity of humanity, had fought very hard to ensure not just the success of this much dreamed of peaceful release from the shackles of torture and brutality worthy of a lifetime condemnation, but also and most importantly, its continuity. Those who pride themselves on the style and soi distant proclamation as rights fighters ought to realise that such onomastic pleasure one takes comfort in using, is with neither meaning nor heavy responsibilities which must at all costs be carried out with absolute sincerity. 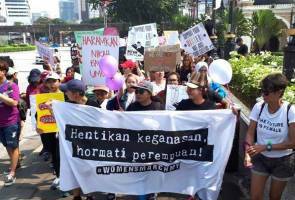 The recent celebration of International Women's Day in Kuala Lumpur, Malaysia was not only welcome happily with such pomp and circumstance but also in sad reflection, was hugely orchestrated into blatant manipulation by the irresponsible few who had failed rather miserably to understand, let alone appreciate the very essence of fight for the rights of women. There appears to be many supporters brandishing banners visibly bearing remarks one would reasonably argue were wholly misconceived and totally detached from the true meaning of and bounds of propriety in one's fight for the interests of women in majority. Significance and deep sense of urgency to have relevant laws in place are not at all attached to the sad reality that many women across the nation are facing where the such-like plights do not cease to befall these unfortunate women each passing day. The enthusiastic chants for equality is arguably not reflective of the various forms of predicament that women continue to suffer. While it is not inconceivable that patriarchy has proved insufficient to provide equality in a given polity, women's call for the demolition of patriarchy in its entirety however is equally as flawed an argument as it is lacking in assurance that the intended order of command by women will be an effective cure-all. Laws and policies which are effected into the legal narratives by the authority where equality and freedom are the epicentre of such legislation and all manner of fairness is guaranteed with utmost certainty can and in fact must be galvanised into action with no attention whatsoever to who actually makes them. Emphasis and weightage should be given on the merits of the existing or proposed laws and not on the misread fact that the decision making power lies in the hands of those of specific gender. It is feared that such is akin to fundamentalism bordering on sexism, both of which ironically enough are what women's rights advocates intend to fight against. Women of financial disadvantage, those continuing to live fearfully under the claws of their abusive husbands who have taken another wife against the consent of the former, leaving their children in total neglect, both financially and emotionally, not to mention the ever decidedly oppressed women who were forced into prostitution due to the misfortune of lives for whatever reasons, amongst others, should secure priority in the pecking order of one's struggle to unburden them of these. Women are not empowered merely through physical presence of women in the force of authority. Instead, laws through which both men and women would with ease and convenience enjoy equal opportunities and results where any potential hint of appearance of bias or prejudice because of gender is nowhere in sight are in themselves a success that every woman should hanker after. At the end of the day, while gender composition of lawmakers is important to ensure neutrality and a sense of equilibrium in the making of laws for people to benefit therefrom, shouting out expletives and fulminating against the make-up as a composite whole on pure ground of gender in absolute disregard to the effects and outcome of such laws shall indispensably defeat the entire aim and purport of freeing women from the chain of these discriminatory laws. Rome was not built in a day not because their freedom-thirsty people lusting after it had gone on a rampage and roared foolishly in want of what was rightfully theirs. It was because of decades of wise planning on structural strata in the society its people had determinedly sought to chart in the name of equality, fairness, and most importantly, guaranteed continuity. Let Malaysia be Rome. Let us all, Malaysians, act like Romans.